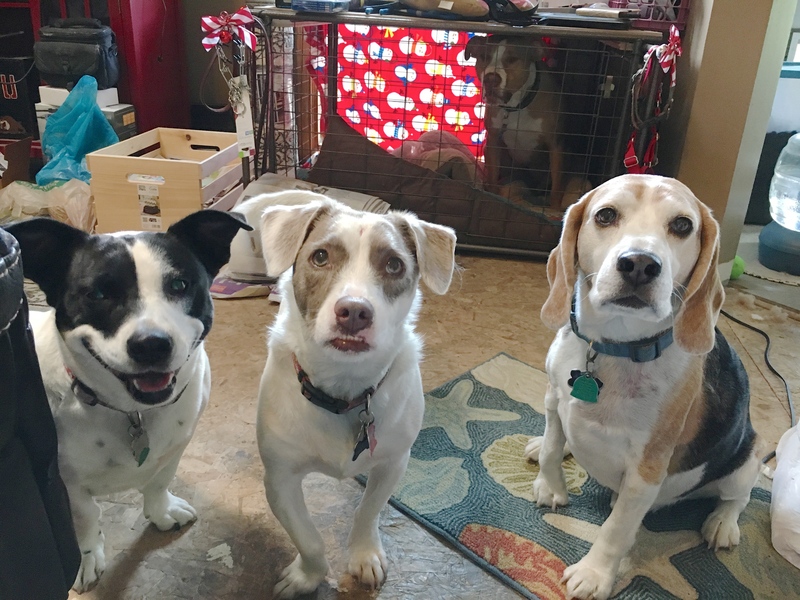 Frankie, Rocky (not pictured), Trixie, Fleabelle and Wessley are a pack of dogs who have been rescued and now live in Omaha. Their guardians set up a dog behavior training session with me to stop dog fights between Frankie and Wessley, stop barking and address some overall anxiety all the dogs display at various times. Because Frankie and Wessley get into dog fights, the guardians have been keeping one of them kenneled when the other is free. When I arrived for the session, it was Wessley who was kenneled so you wont see him in the greeting video below. These dogs have gathered together due to the guardian’s being really big hearted people as the dogs have been “given” to them by their children when the dog had issues or other dogs abandoned and in need. As a dog behaviorist, one of the first things I always do is sit down and chat with the dog’s guardians to get a better idea of what dog behavior problems they need help with. In the course of that discussion, I learned the dogs didn’t have many rules to follow. The more dogs you have, the more important structure is. Especially when you have rescue or dogs who are not coming from a calm and balanced background when it come to their behavior. In this house, a lack of rules had resulted in many dog behavior problems that the guardians didn’t want and asked me to help stop. After suggesting a number of rules, ways to enforce them and how to utilize positive dog training to reward desired actions and behaviors, I spent a few minutes showing the guardians how to stop the dogs from getting over excited while being petted. As a dog behaviorist, something I always try to do is help my clients realize that anything their dog is doing when they pet it is what they are rewarding. So avoiding petting your dog when in an overexcited or any other unbalanced stats is always a wise approach. Next up was Frankie’s habit of coming out of his guardian’s bedroom and racing over to Wessley’s kennel to bark at him. I would not call this dog aggression. It was more in line with a talking back to or pseudo taunting. If allowed to continue, Frankie’s barking at Wessley will not only cause further damage to their relationship, it will also cause stress, anxiety and frustration for their guardians. I knew I needed to show the guardians a technique to stop dog barking. I spent a few minutes going over a technique to address this dog behavior problem and give the guardians an approach that will help stop dog barking. You can get a few free dog behavior secrets and learn about the technique I suggested in the video below. Dog neuropathways align in the same way that ours do. Just like you always take the same path when driving to work (because your neuropathways have aligned), dogs are creatures of habit. If you can block them from engaging in unwanted behaviors for a month or so and provide them with an alternative, they can easily get into a new habit. By preventing Frankie from running over to bark at Wessley while in his kennel for a month, his guardians can help him develop a new near pathway. While preventing Franking from running over to bark at Wessley will help, its not going to solve the underlying cause for this behavior. In order to do so, it will be important for the guardians to start building up positive associations between the two dogs.